Each weekend during the run of mainstage shows, audiences can look forward to free pre-show performances, panel discussions and actor talk-backs. Check the website for updated details on upcoming performances. 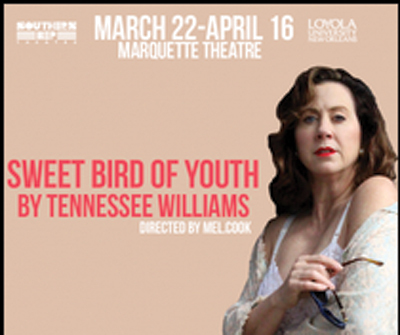 “Sweet Bird of Youth” (March 22-April 16). Southern Rep continues its commitment to the Tennessee Williams canon. Presented in partnership with the Tennessee Williams/New Orleans Literary Festival, Leslie Castay stars as a silver screen legend humiliated in a comeback try. Directed by Mel Cook. At Loyola University, Marquette Theatre. “Father Comes Home from the Wars (Parts 1, 2 and 3)” (May 31-June 25). It’s West Texas in 1863, and a slave is promised freedom in exchange for his service in the Civil War – on the Confederate side. By Suzan-Lori Parks, directed by Valerie Curtis-Newton. At Loyola University, Marquette Theatre. The next phase of Southern Rep’s new-play programs for local artists is called 4D – for dramatists, directors, “dramaturgs” and development. 4D will feature an invited works-in-progress reading in April/May of 2017 and two nights of staged readings in December 2017/January 2018. With artistic directors Gary Rucker and Kelly Fouchi at the helm, the lovely theaters near the riverside in Kenner keep the musical fun coming. Alfred Hitchcock’s “The 39 Steps “ (March 10-26). The popular comedy returns, with four actors portraying dozens of characters. A brilliant madcap directed by Ricky Graham, starring Marc Fouchi, Jessie Terrebone Thompson, Mason Wood and Gary Rucker. “Schoolhouse Rock Live Jr.!” (March 31-April 9) Teaching history, grammar, math, science and politics through clever, tuneful songs is delightfully entertaining. “Hello, Dawlin’” (April 21-30). Favorite Broadway shows done New Orleans-style. Presenting “Phantom of the Okra,” My Fair New Orleans Lady” and “West Bank Story,” created and performed by Ricky Graham, Jeff Roberson, Sean Patterson and Jefferson Turner. “Bye Bye Birdie” (May 5-21). Hip-swinging singer Conrad Birdie is about to be drafted into the army, to the dismay of adoring fans. HIs agent and friends cook up a plan to send him off in style, including writing him a new hit song. Directed by Gary Rucker. Disney’s “The Little Mermaid” (July 13-23). Ricky Graham directs a hauntingly beautiful musical love story for the ages. In a magical kingdom, we meet Ariel, the little mermaid who is tired of flipping her fins and longs to be party of the fascinating world on dry land. Le Petit offers a season of fresh performances under artistic director Maxwell Williams and managing director Katie Hallman. “Great Scott!” Joplin in the Quarter (March 12). In commemoration of the 100th anniversary of the King of Ragtime’s death, former New Orleans International Piano Competition gold medalist Richard Dowling performs a selection of Scott Joplin’s most beloved piano masterpieces. “Dividing the Estate” (March 24-April 15). The third regional premiere of Le Petit’s season is the winner of the Outer Critics Circle Award for Outstanding New Off-Broadway Play in 2007, and a two-time Tony nominee. Stella Gordon is dead-set against parceling out her family’s land, despite the financial woes brought on by the oil bust of the 1980s. Her three children, however, have another plan. Old resentments and sibling rivalries surface as the members of this hilariously dysfunctional family go head-to-head to claim the biggest piece of the pie, in a masterpiece by Horton Foote. “It’s Only a Play” (June 9-25). In partnership with independent theatre company The NOLA Project, we present the outrageously funny farce by Tony- and Emmy award- winning author Terrence McNally. It’s the opening night of the brand new play on Broadway, and wealthy producer Julia Budder is throwing a lavish party in her opulent Manhattan townhouse. The home of Broadway in New Orleans, the majestic Saenger Theatre regularly hosts performances by Broadway-based touring musical companies. 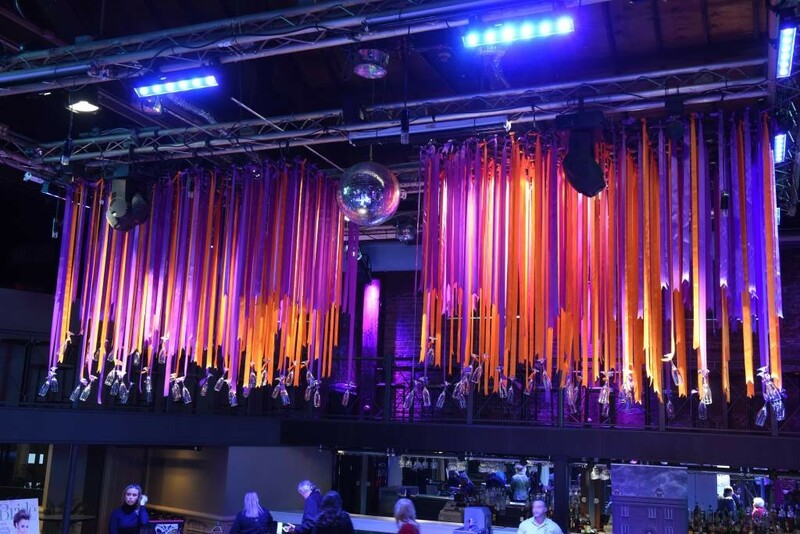 In between the big musical shows, the theatre presents musical concerts and solo entertainers. See the website for the full lineup. “The Bodyguard” (April 4-9). A former Secret Service agent turned bodyguard is hired to protect superstar Rachel Marron from an unknown stalker. The award-winning musical will star Grammy nominee Deborah Cox. “Finding Neverland” (May 9-14) The incredible story behind one of the world’s most beloved characters, Peter Pan. The magic of Barrie’s classic tale springs spectacularly to life in this heartwarming theatrical event. “Mamma Mia” (June 6-11) Enchanting tale of love, laughter and friendship, and every night everyone is having the time of their life. “Escape to Margaritaville” (Oct. 20-28) In this island paradise, city folk get away from it all and the locals get into the kind of trouble you can almost always sweet talk your way out of. Justin Hayward (March 7). Former star of the Moody Blues, his enduring talent helped define his times. Ryan Adams (March 14). His new album is one of the most personal yet universal works of his mercurial catalogue. The Charlie Daniels Band (March 31). The genre-defining Southern rocker remains an outspoken patriot at age 79. Lisa Lampanelli – Live (April 14). Comedy’s lovable Queen of Mean. Umphrey’s McGee (April 21). More than just a rock, they have proven to be on the cutting edge of both music and technology. St. Paul & The Broken Bones (April 27). Sea of Noise, the second full-length album by St. Paul and the Broken Bones, marks a quantum leap in sound and style for the high-voltage Birmingham, Ala.-based band. Ben Harper and the Innocent Criminals (April 28). The Meters (April 29). The founding fathers of funk reunite and celebrate 50 years of music, with special guest Ivan Neville and surprise guest artists. Professional, classical theatre with a primary focus on the works of William Shakespeare shapes the mission of this dramatic festival, now in its 24th season. Summer mainstage performances are held in the Lupin Theater, located in the Dixon Hall Annex (Building 69). “The Taming of the Shrew” (June 2-18) A bawdy comedy that turns raw and heartbreaking as Petruchio tries to tame the unbridled Katherina, and men vie for the affections of the dutiful Bianca. Directed by Emilie Whelan, the production is presented in collaboration with Cripple Creek Theatre Company, drawing from original staging practices. The production will tour to local underserved audiences – as well as a prison – before opening the mainstage season. “The Tempest” (July 7-23). Wrongly accused and exiled for 12 years, Prospero sets out for revenge, but finds redemption in the process. Both magical and moving, Shakespeare’s masterpiece questions what it means to love and forgive. • A one-night only presentation of The NOLA Project’s hilarious “By Any Scenes Necessary” (July 19). • Staged readings of Shakespeare’s classics with special guest artists include “Titus Andronicus” (June 7) and “Othello” (July 12). • A screening of the Globe Theatre’s hit production of “Twelfth Night” stars Mark Rylance (July 13). With a mission to preserve one of America’s greatest art forms by producing the highest quality musical entertainment, Summer Lyric Theatre exists to support and develop musicians, actors, singers, dancers, technical artists and most important, promising students. The theatre presents three productions each summer under the artistic direction of Michael McKelvey. “Annie Get Your Gun” (June 22-25). One of the first shows Summer Lyric ever produced is coming back. An award-winning score by Irving Berlin made this one of the most indelible titles in the repertoire of the American musical since its debut in 1946. “Hairspray” (July 13-16). Infused with a score that pays homage to Motown, period pop and rock, and classic musical theatre, it has been described as “having the pleasure of an old-fashioned musical without being old-fashioned.” Hairspray ran for six years on Broadway and had multiple sold-out tours. “Gypsy” (Aug. 3-6) What season tribute to leading ladies would be complete without the iconic character Mama Rose? Based loosely on the memoirs of Gypsy Rose Lee and adapted for the stage by some of Broadway’s most heralded creators, “Gypsy” is sure to leave audiences humming for weeks after the curtain drops. The grand art deco theater regularly hosts hot bands and popular comedians at a location on the Canal streetcar line in downtown New Orleans. John Waters, This Filthy World (March 18). His style and creativity occasionally test the boundaries of propriety. William Singe & Alex Aiono (March 21). Young up-and-comers display the talents that have won them an indie following. Randy & Mr. Lahey of Trailer Park Boys (March 23). A silly, sexist, drunken 90 minutes of songs, skits, audience participation, and general hilarity. Portugal, the Man (April 13). While dedicated to rock and roll, Portugal. The Man still remain unsettled on the outskirts of any set genres. Honey Island Swamp Band (April 18). The group recently recorded “Demolition Day” at The Parlor Recording Studio in New Orleans. Dark Star Orchestra (April 27-28). Performing to critical acclaim worldwide for nearly 15 years and over 2000 shows, the group continues the Grateful Dead concert experience. STS9 (April 29-30). The instrumental electronic rock band has experienced a meteoric rise on the international music scene.